The Dallas Police Department has posted data at Dallaspolice.net on officer involved shootings (OIS) from 2003 to the present date. The Department previously announced that this data would be available on the website by the end of November to enhance transparency surrounding the use of lethal force by Dallas Police Officers. The webpage contains a message from the Chief of Police, an explanation of why the information is being provided, a description of the OIS investigative process, the department’s deadly force policy and steps the department has undertaken to reduce the likelihood of a deadly force incident. Also included are graphs depicting the number of OIS incidents during this time frame, the disposition of the suspects in the shootings and the number of officers criminally assaulted during the same time period. A map of the city shows the location of each OIS during the years of 2013 and 2014. Finally, the webpage contains a matrix with information from each individual OIS from 2003 to the present day. By clicking on the case number, visitors to the website can see a brief summary of each incident. 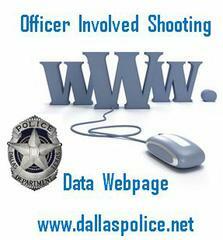 The Dallas Police Department is committed to keeping the community informed regarding officer’s use of deadly force. This webpage establishes a foundation from which this data can be shared. We invite all interested individuals to visit the site to gain knowledge on this important subject.